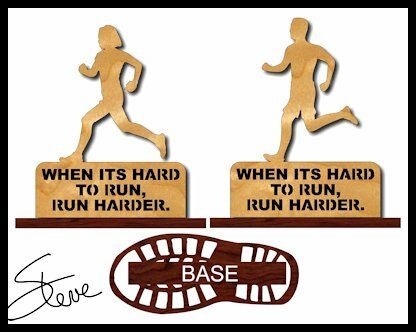 Runners trophy with a running shoe shaped base. There are millions of recreational runners in the U.S. alone. If you have a runner in you life make them this motivational trophy. Disclaimer: Read at your own risk. This post is pretty long and there are more than my usual ads for my products. Not trying to spam you guys it just kind of worked out that way for this post. 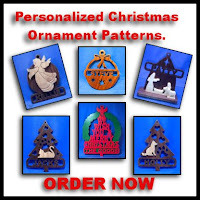 I'm still taking orders for the personalized Christmas ornaments and I came up with a new DVD today. Feel free to skip right to the free pattern download button if you don't like the ads. If your eyes accidentally see the beautiful, fantastic, incredible and super valued products while you scroll past the ads that's fine. Don't let the shock of what you see make you stop scrolling past the ads. If you stop you will be overwhelmed with the impulse to send me money. It's a trick just like the peanut m&ms at the checkout line. They call out to me. They beg me to take them home. It's not my fault. I try to resist but the marketing gurus know I'm weak. Just look at the bright colors and the cute little guys swimming is a bowl of chocolateeee fun. I got to go to the store. I'll be right back. I had a request for this product so I set it up today. I have been selling my "Wooden Vases on the Scroll Saw"Edition 1 and 2, for some time. They have been a nice selling product for me. The eBooks cost $12 each and are available for immediate download after purchase. The eBooks are available at this link. This DVD has the same two eBooks plus an instructional video. I am making this DVD available for people who either have trouble downloading the files or just prefer the physical DVD. The combined cost of the two eBooks is $24. I am reducing the cost of the DVD to $19. I am doing this because there is a shipping cost on the DVD and the reduction will probably cover the additional cost for you. The shipping usually runs about $5. There are a total of 16 Wooden Vase patterns between the two books. This picture shows four from the first edition. They range is size from 5 inches to 14 inches tall. This picture shows three of the vases from the second edition. 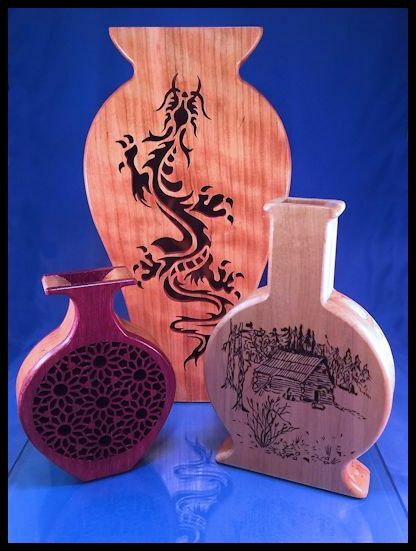 I uses different ornamentation techniques on these projects including wood burning, inlay and paint and fretwork. This image shows the scale of the largest vase. 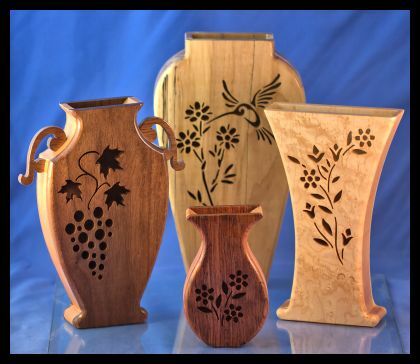 These are display vases. They are not designed to hold water and real flowers. Some of them look great with silk flowers. I will be out of traveling this week. Orders may be delayed. Email Newsletter Readers: Remember that the Newsletter is just a copy of the daily blog post. To see the post in it's proper formatting click this link. If you ever misplace a pattern or any item you see here you can always find it on the blog. Everything stays on the blog forever. your source for Pegas scroll saw blades and craft supplies. 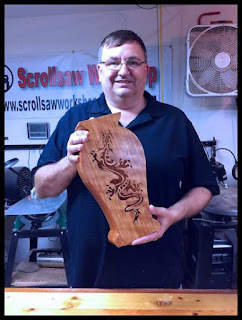 Do you need a source for scroll saw ready boards? the source you have been looking for. Let me teach you to create a beautiful wooden portrait pattern. I will show you everything you need from start to finish. The video will show you the free software program you can download for Windows or Mac OS. I will show you how to install the program and configure it for best results. Then I will show you the technique to take your photograph and make a pattern from it. When the pattern is complete we will go in the shop and cut it. Purchase the entire Scrollsaw Workshop pattern catalog for offline access. This DVD has 1,964 patterns published from 2007 thru 2016. The DVD is $20 plus shipping. Ships to 60 countries around the world. Want to create beautiful wooden vases on the scroll saw? 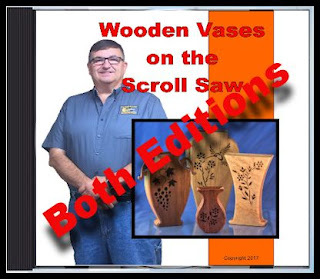 My two "Wooden Vases on the Scroll Saw" books make it easy. The books are $12 each and available for instant download after purchase. Click for Video Demonstration. The Scrollsaw Workshop is primarily supported by donations. If you enjoy this Blog and would like to make a donation please click this Button. Your support is greatly appreciated. Masterplug's easy to use case reel electrical cord keeper is perfect for use in your workshop, home, yard or light industrial project site. 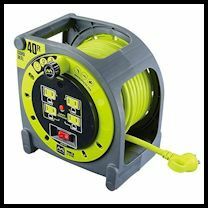 An integrated 40-foot cord easily winds around a rugged spool that features four surge-protected outlets (120V / 10amp each) that ensure you have power where you need it. The durable construction and sturdy steel base ensures a long-lasting solution to keeping your extension cords neat and tangle-free. This reel is also designed to easily mount on the Masterplug Wall Mount Bracket (sold separately) for convenient storage. All Masterplug products are backed by our hassle-free 3 year warranty.